Provide comfort for the family of Helen Morgan with a meaningful gesture of sympathy. Helen E. “Honey” Morgan, 94, lifelong Waterville resident, passed away Thursday, November 29, 2018 at the Waterville Residential Care Center. She was born May 28, 1924 in Utica, a daughter of Francis P. and Mabel Condon Morgan. She was a graduate of Waterville High School and received her Bachelor’s Degree from the College of New Rochelle. Following her graduation, she lived in New York City and worked for the railroad scheduling trains across the country. Returning to Waterville, Honey worked in the family business, F.P. Morgan & Son Hardware until retiring in her 80’s. She worked alongside her father(Frank), her brother(Jim), and her nephew (Tom). She knew her hardware and plumbing! She was a good athlete who enjoyed playing sports, especially golf and tennis. Honey was an avid reader and loved watching the NY Yankees and the NY Giants. see the leaves changing, the deer, or the birds, squirrels and woodchucks in her yard. Recently, she loved watching the deer and turkeys that would frequent the grounds at Waterville Residential Care. 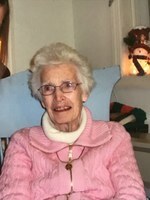 She was a communicant of St. Bernard’s Church in Waterville where she was a member of the Altar and Rosary Society, taught religious education at one time, and had been an eucharistic minister. Honey had a very strong faith and devotion to the Blessed Mother and Padre Pio. Surviving are a brother-in-law, Roy Roher of CT; nephews and nieces who meant the world to her, Jim Morgan, Tom (Tammy) Morgan, Teresa (Mark) Kaplan, Donna (Peter) Green, Debbie (Jerry) Plourde, Jody (Rich) Smith, Bob (Emily) Roher, Kathy (Chris) Gadomski, Carol (Jim) McCloskey, Lorrie (George) Morton, Connie (Jay) Kearns, Virginia Roher, Janet (Norman) Smith, Patricia “Patty” Northrop, Carla Landy, Keitha (Peter) Murray, Craig (Mary) Landy, Pamela Arian, Morgan (Katherine) Landy; many great-nieces and great-nephews and great-great nephews/nieces. She was predeceased by her brother and sister-in-law, James and Veronica Morgan, sisters and brothers-in-law, Jeanette and Harry Northrop, Geraldine and Michael Canning, Patricia and Joseph Landy and Marilyn “Sugar” and Stanley Bardeen and Betty Roher, an infant brother, Francis, a nephew, Douglas Landy and niece Nancy Morgan. Honey’s family wishes to acknowledge her devoted niece, Donna, who spent countless hours supporting Honey in her final years and was with her when she passed. We also wish to thank her loving neighbors who always looked out for her; the Gibbons, the Gridley’s, the Richmond’s, the Murray’s and the Maxam’s. Special thanks to her caregivers who made it possible for her to stay at home as long as possible. Thank you to the staff at Waterville Residential Care, and to Dr. Sullivan and Dr. Chabot for their care over the years. We are grateful for Lorena who brought Honey communion every week. A Mass of Christian Burial will be celebrated at 11am Wednesday, December 5, 2018 at St. Bernard’s Church, 199 Stafford Ave., Waterville. Interment will be in St. Bernard’s Cemetery in the spring. Friends are invited to call at the Burgess & Tedesco Funeral Home, 210 E. Main St., Waterville on Tuesday from 5-7pm. The rosary will be recited at 4:45 pm. Contributions in her memory may be made to St. Bernard’s Church Memorial Fund. To send flowers in memory of Helen E. Morgan, please visit our Heartfelt Sympathies Store. Provide comfort for the family of Helen E. Morgan by sending flowers. My condolences on the loss of your Mom. She was a wonderful person and you all have that part of her in you. May the angel we know by name continue to watch over you all. Honey was always such a sweet women and a great neighbor. When we lived across the street from her you could set your clock as she ran to and from church and the store. It was always with a smile on her face. She will be missed.